Tuesday night we left for Alastaro, Finland. A 1880 km journey and 10 hours of ferry later we arrived at the track... 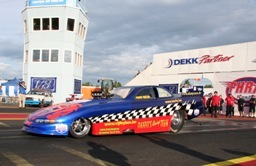 The weather was lovely with plenty of sunshine, too bad only 6 funny cars were competing in the race. The qualifying runs resulted in good ET's, all under 6 seconds. Danny's Racing Team qualified 6th with a superb 5.91s / 395.63 km/h, a new personal best and Danny became member of the 5 second club! Everybody was delighted with the performance of course. In the first round of eliminations we were up against Ulf Leanders, but being on the right lane with less grip, and a massive tireshake that lifted the car with it's 4 wheels off the ground took us out in the first round.